British pound is consolidating under new three-week high at 1.3174 in early Thursday's trading, with bulls show initial signs of fatigue. Strong upside rejection on Wednesday, overbought slow stochastic and south-turning momentum warn of consolidative/corrective action, however, strong bullish sentiment on Brexit optimism, weaker dollar and overall bullish daily techs, keep near-term bias with bulls. 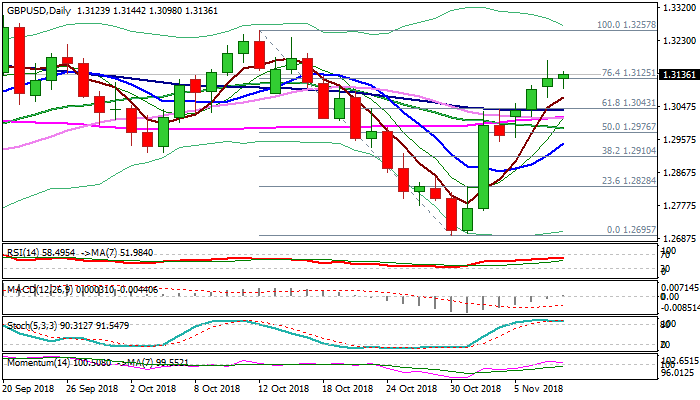 This suggests that consolidation might be limited before attack at immediate barrier at 1.3187 (falling 30WMA), break of which would open way towards key barriers at 1.3257 (12 Oct high) and 1.3297 (20 Sep peak). On the other side, extended corrective dips should be contained by daily cloud top (1.3055) to keep near-term bulls intact. Focus turns to Fed rate decision due later today, which could affect pound's bulls if US central bank keeps hawkish stance.